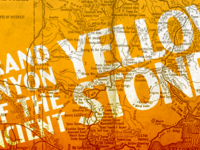 During a type design workshop, I brought one of Yellowstone National Park’s signage typefaces into the digital world. I fell in love with the warmth and honesty of hand-made type found on trail signs in Yellowstone and decided it deserves a digital companion. It was the perfect starting point for a type design workshop at our university.